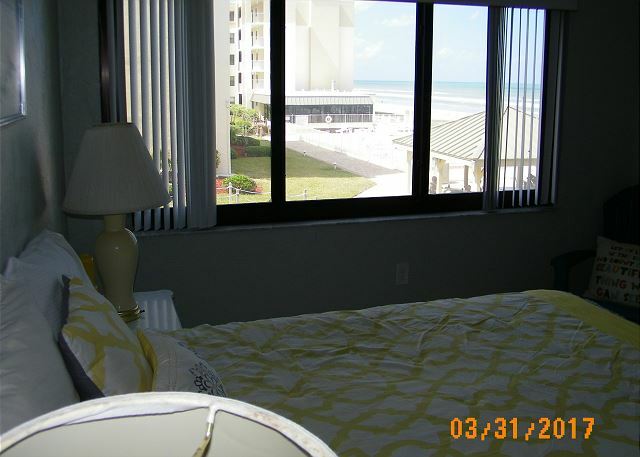 Newly remodeled spacious two-bedroom, two-bath condominium includes an amazing ocean view located directly on the non-driving portion of beautiful New Smyrna Beach, (the best beach in Florida). The second floor unit has been completely renovated in late 2016. Upgrades include a new full kitchen, two new bathrooms, and new porcelain tile flooring through. All new doors were installed and all walls and ceilings updated and freshly painted. Newly updated furniture in the dining and family room were also added. The master bedroom has a queen size bed, large chest of drawers and closet. The guest bedroom has twin beds, large closet and plenty of drawer space. 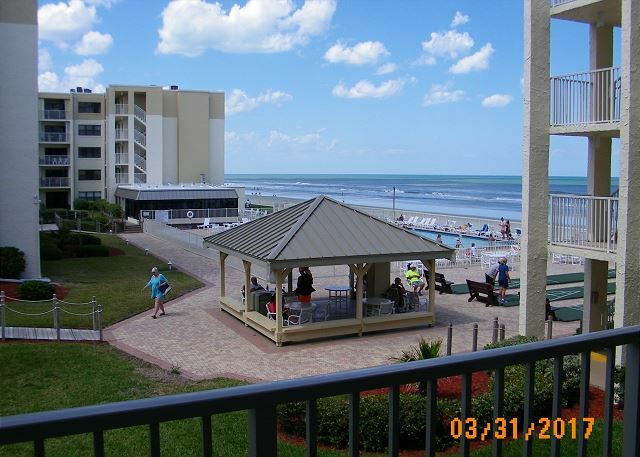 The condo is completely furnished with w/ central air, flat screen color TVs, refrigerator w/ ice maker, self-cleaning oven, dishwasher, disposal, cooking utensils, small appliances, dishware and ample linens. Also, beach chairs, umbrella and beach toys for the kids are included. Check your email or search the web on the free Wi-Fi. The unit is capable of comfortably accommodating four (4) adults, with a maximum of six (6) persons. Sorry, NO PETS. 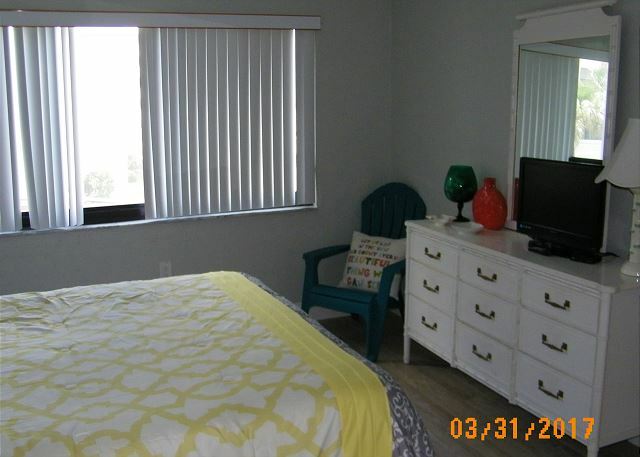 This unit is 1 hour away from Orlando, Home of Disney World, Sea World and Universal Studios, Water Parks and only one-half hour from Daytona, Kennedy Space Coast and the Casino Cruise! 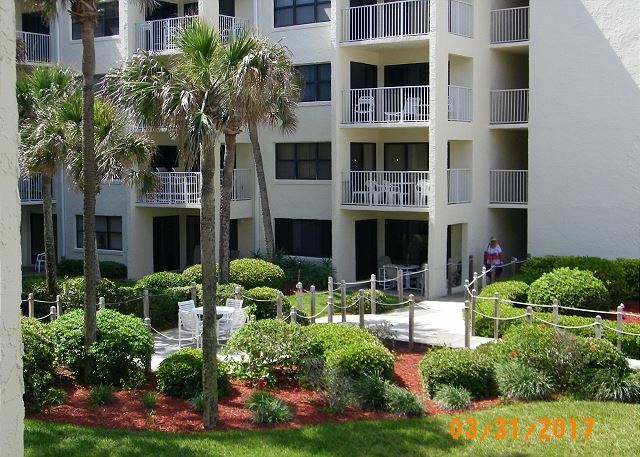 Condo offers tennis court, shuffleboard, gas barbecue grill, gazebo, rec area. Steps from the pool you have a beautifully white sandy beach to fish, swim, surf, play volleyball, bicycle, walk, run or sail. Castle Reef is a FAMILY-FRIENDLY BEACHFRONT COMPLEX that has recently undergone major structural renovation. Unlike many condominium complexes, it is designed with an abundance of green space and nicely landscaped courtyards. Nice place to stay. It is quiet and right on the beach. GREAT TIME. GOOD WEATHER. LOTS OF R & R. JUST WHAT WE WANTED. NO PROBLEMS. Condo was beautifully renovated and very clean. Everything we needed was provided. Very nice pool and beautiful beach. Condo property was well maintained. Sliding door to patio was really hard to open (probably needs to be replaced) and some of the blind slates were broken but that's being picky. We would certainly stay again. Great apartment, gorgeous pool and territory. Apartment better than I expected. We have excellent vacation with our new high school graduates granddaughter. It was fun. Very nice remodeled Condo. Clean and new in most cases. Well stocked with dinnerware and utensils. We felt a little insecure because the balcony sliding door could not be locked and the shades in the bedrooms would not completely close properly. THIS IS OUR SECOND YEAR AT CASTLE REEF AND WE LIKE IT ALOT.THE CONDO WE STAYED IN WAS CONVENIENT TO ALL AMENITIES BUT WAS NOT HAPPY WITH THE SHOWER'S AND CLEANLINESS COULD HAVE BEEN BETTER. The room was great, well stocked and clean, nice view and close to elevator. Very comfortable for my family of 5. Our only problem wasn't with the room but the clerk at the desk, very rude, there was construction goin on and I called to see when it would be over and she was rude and hung up on me. But other than her and the constant beeping from the tractors it was a great trip. I will still give 5 stars because it's not the owners fault that the desk clerk has an attitude.